In 1933, famed science fiction writer H.G. Wells wrote a book called The Shape of Things to Come which dealt with a future history for the century after 1936. 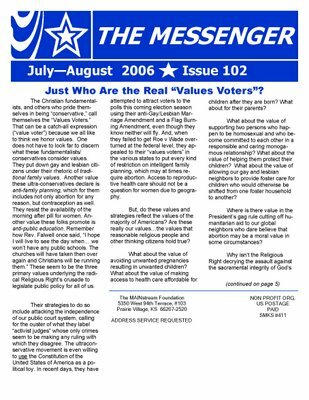 Much like that future history, after I did the post on the South Dakota Mainstream Coalition, I find myself wondering about it’s future history. In five years will it be consigned to the dust heap of bad political ideas, or will it develop into something further? And if it does develop into something further, what form will it take. They're pretty strong in their statements, and that's ok. They're entitled to their opinion. But now, here's the part that I think that South Dakota Republicans ought to pay particular attention to. 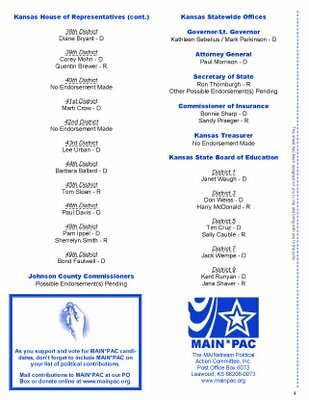 Here's the part of their newsletter where they're endorsing candidates. Granted, this is a primary election. 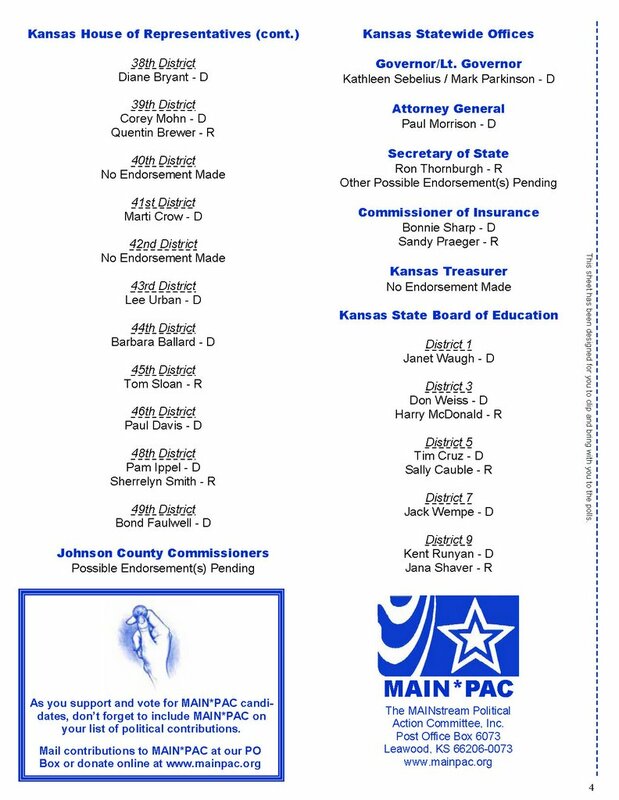 But I'd also assume the Kansas organization will soon be endorsing candidates for the fall. And if so, how many Democrats will they be endorsing over Republicans? Because on this list, I count far more D's than R's. 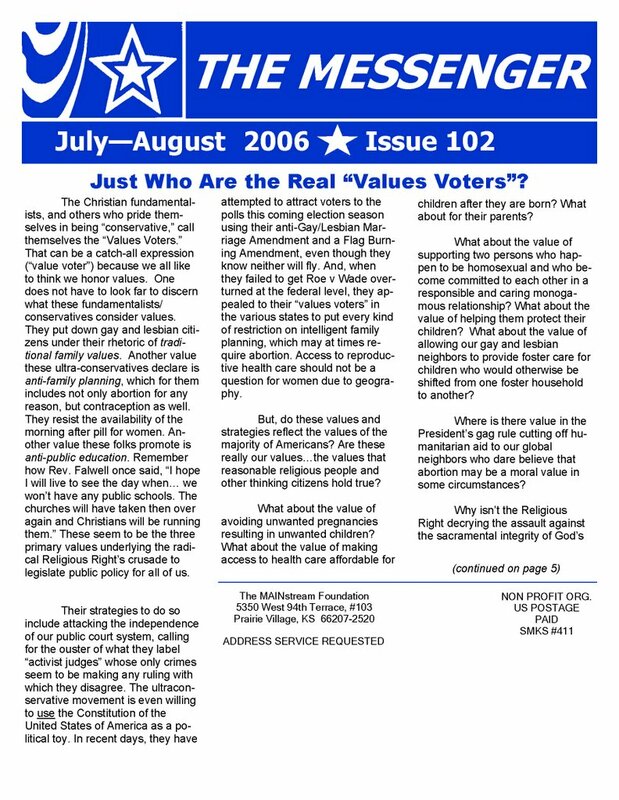 What is my concern on the future history of a South Dakota MAINstream? If the South Dakota MAINstream coalition follows suit and begins a process of endorsing candidates, we can probably expect that this "non-partisan" organization founded by Republicans legislators could soon be endorsing Democrats over the Republicans who stand with the organization's founders in the GOP caucus. This concern is a perfect illustration why House Majority Leader Joe Barnett demanded (or so the story goes) that there would be no caucus or groups outside of the Republican caucus. And he would wield his authority of bill and committee assignments to enforce it. 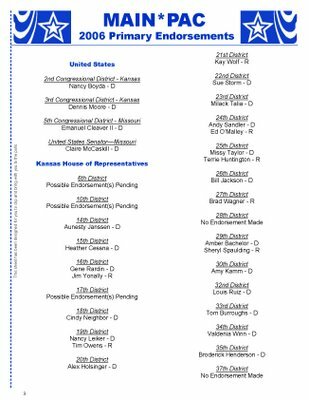 Because if we consider if the SD MAINstream group could soon do what the Kansas group is doing (aside from spying on churches) this group founded by Republicans might be working in general elections against Republicans. And for this Republican, where's the sense in that? I think the leadership of the party needs to put their foot down and require that those elected Republican party members who comprise the caucuses to knock off the coalitions, or face a penalty for their dissent. Does stripping people of their chairmanships seem a little harsh? Possibly. But if they keep publicly biting the hand that feeds them their lofty positions, those of the opposite party will get elected, and they'll lose those lofty position anyway, because I have yet to see the day in South Dakota where a Democratic legislative chamber allows a Republican to hold a chairmanship. That's been my objection to the MAINstream coalition all along. It does nothing to make the Pary stronger. And if the shape of the MAINStream to come holds true as predicted, it could work actively to defeat the party that spawned it. And that's a valid concern. Unless it was the goal of the founders in the first place. PP, you're full of assumptions. You know what they say about assumptions. So it's more important to follow the party line than to endorse the person who can do the best job for the state? That way of thinking is one reason that people are so divided in this state. I had an inside look on how local governments worked in my area when I worked as a reporter. People who couldn't stay awake during meetings, which they were paid to attend, would get re-elected again and again. Why? Because they belonged to the dominant party in a county where too many people voted straight tickets. Thank heaven there are still people who are independent thinkers. Looks like somebody stirred up the DOWNstreamers! Guess when you don't have anything to run for, you can stay up late at night blogging. The MAINstream liberals abhor those who are independent thinkers. Conservatives are a rare commodity at most levels of the government. They are the ones left standing on an island when they cast one of the handful of votes against more government intrusion into the rest of our lives. But, anon 12:09, they're not the ones you're thanking heaven for, are they? 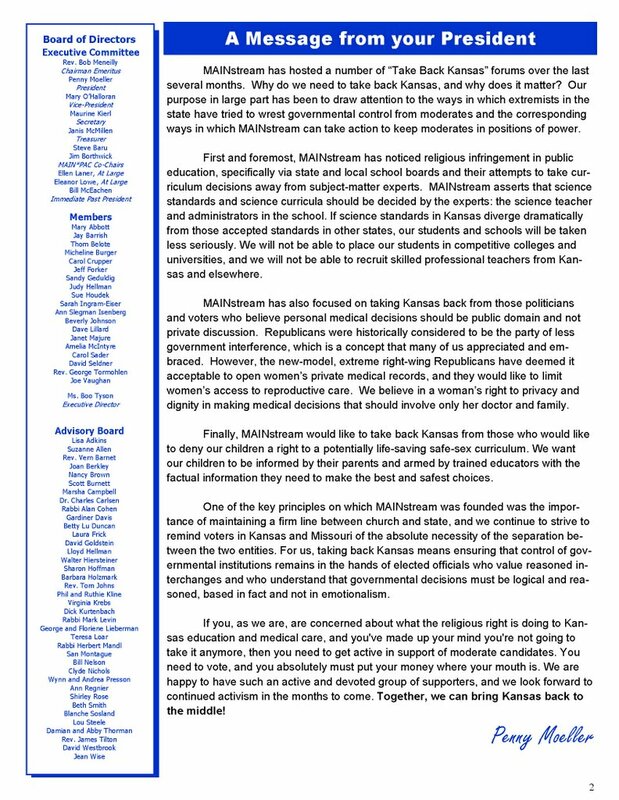 "Because if we consider if the SD MAINstream group could soon do what the Kansas group is doing (aside from spying on churches) this group founded by Republicans might be working in general elections against Republicans." What, like having a state party official run against an incumbant State Senator. 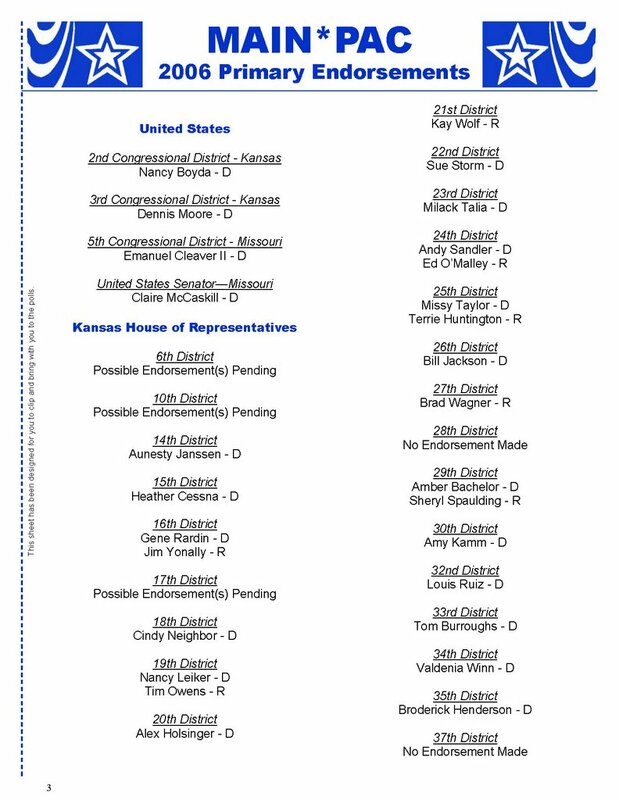 Have Several other state sentators openly campaign against said incumbant. Put up flakes like Isaac L. against another Senator with the help of the party hierarchy. Have several influential Senators and the state party chair along w/other elected officials drive out the PUC chair. What on God's green earth allows you, PP, to forget that the current Republican Party in SD eats its young (or its old and rich). You have a party in SD that is broken because the nuts (RF, LS, BN, JA, BG) have WAY TOO MUCH influence and freedom to act. Yes, this is a Mainstream post and those people are going in circles. We need a Strong Republican Leadership with broad support and control of the Leslee Unruh's of our party. Yes, that what I, will call the member's of my party identified above by initials only. The Unruh's of the GOP. MAINstream is the only alternative to the Extreme Wacko / Right that has taken over my political party and driven away exceptional people like the State PUC chair. Makes me sick - thank you MAINstream. 1:18, so you say that it is conservatives casting votes against more government intrusion into our lives? Wrong again. It is conservatives who claim there is no right to privacy in the constitution. It is conservatives who don't think women can make their own decisions about abortion. It is conservatives, like President Bush who claim that government can spy on our bank records, phone records, e-mails without any court oversight or limits. It is conservatives who think government can imprison even American citizens indefinitely without trial by unilaterally labeling them terrorists. If conservatives get their way, we will have a total fascist police state. We're already most of the way there if Bush gets his way. If you want limited government, it's time to vote for Democrats. Anon 1:18 - Government intrusion comes in many shapes and forms. Right now anyone who can think on their own and not take the radical route (in either direction) is a breath of fresh air in South Dakota. 1:13 AM - Looks like you stayed up late too. What is a downstreamer? I've never heard the word before. Is that a derogatory term? 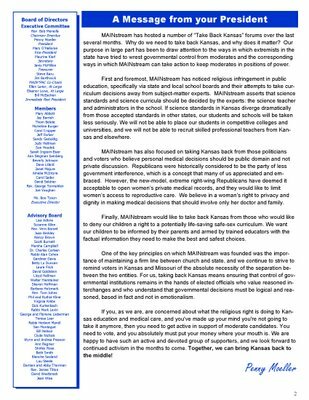 though i disagree w/ the mainstream coalition's stances, they would be right to put their principles over politics. when party becomes paramount to principle, you might as well flush the whole thing down the toilet. Amen lexrex, guess PP would disagree w/you on that one. I completely agree with you, lexrex. I sometimes think that those of us who are passionate about issues might have more in common with each other than we do with the decidedly dis-passionate party faithful. The most loyal partisans are those who take a stand and voice their opposition when they feel the leadership is betraying the party's core principles. Bravo MAINstrain! Keep up the good work.